The Microsoft Photos app is a photo viewer software in Windows 10 that comes with your Windows 10 installation. If you haven’t installed any other photo viewer software, Photos app will be used as the default photo viewer. 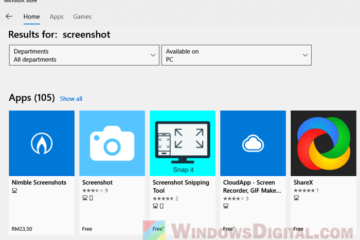 Photo apps is generally convenience, yet most of Windows users including us don’t like it due to its drawbacks such as blurry images, lack of photo viewing features and functionalities, bad UI, etc. We have listed three what we thought is probably the best photo viewers for Windows 10 as alternatives to the default Photos app, and they are all free to download and use. If you came to this page from a search, I probably wouldn’t need to explain why you should replace Photos app with an alternative photo viewer in Windows 10. You should already know why. Without further ado, here are the 3 best photo viewers for Windows 10 we recommend. Photo collectors and enthusiasts would surely know that IrfanView is probably the best Photo viewer in the market and works perfectly in Windows 10. It is fast, compact, simple but powerful, support nearly all types of images files, and most importantly free to download and use. Give it a try and you will know how awesome this photo viewer software is. IrfanView has everything you would ask for when viewing and managing photos. Here are some specs and features of IrfanView Photo Viewer for Windows 10. You can download IrfanView Photo Viewer for Windows 10 64 bit or 32 bit from irfanview.com. The software itself is free to download and use but you can always support the developer by donating them on their website. We rate IrfanView 9/10 as the best photo viewer alternative for Windows 10. FastStone Image Viewer is another prominent photo viewer, converter and editor for Windows 10 known by users from all around the world. It has a simple interface, powerful photo manager, supports all major graphic formats including JPEG, JPEG 2000, GIF, Animated GIF, PNG, WMF, ICO, TGA, BMP, PCX, TIFF, EPS, PSD and some camera raw format files like CRW, CR2, NEF, PEF, RAF, MRW, ORF, SRF, ARW, SR2, RW2 and DNG. It also allows basic editing such as image conversion, resizing, cropping, color adjustments, red-eye removal, musical slideshow with 150+ transitional effects, lossless JPEG transitions, emailing and much more. 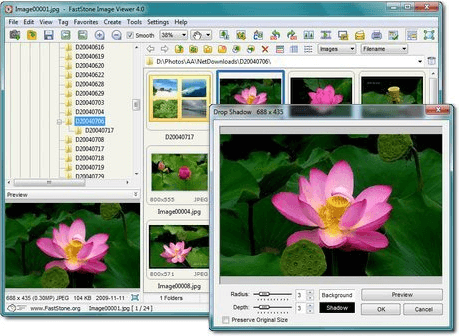 Faststone has a few products – FastStone Image Viewer and FastStone Photo Resizer which are both free to use for personal and educational use only. 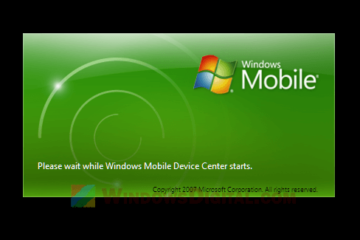 Whereas Faststone Capture and FAstStone Maxview are shareware which come with a free trial that will expired which you will then need to purchase its license later. However, you will need to pay for a license for any of FastStone software if you are to use it for commercial purposes. You can download FastStone Image Viewer or other FastStone products from faststone.org. 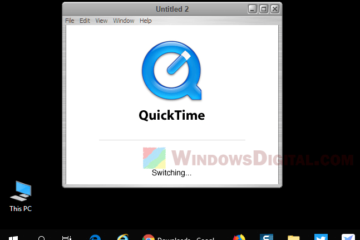 We rate FastStone Image Viewer 9/10 as one of the best photo viewers for Windows 10. 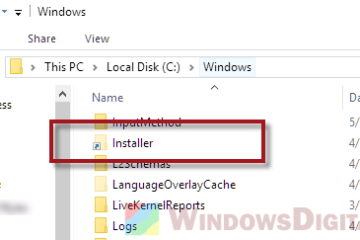 If you want a comprehensive photo viewer for Windows 10, we would recommend using either IrfanView or FastStone as listed above. 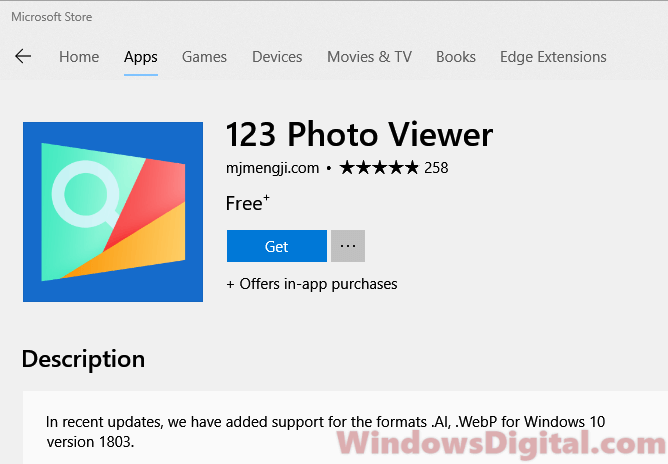 However, if you are looking for only a simple photo viewer with simple interface and not too much complicated functions, try 123 Photo Viewer which can be downloaded directly from Microsoft Store. It is a free to use software with some in-app purchases. It is by far the highest rated Photo Viewer in Microsoft Store that has mostly positive reviews from users who have tried it. You can download 123 Photo Viewer by going to Microsoft Store. Search for 123 Photo Viewer, and then click Get to download and install the app. We rate 123 Photo Viewer 8/10 as the most simple yet powerful photo viewer for Windows 10. 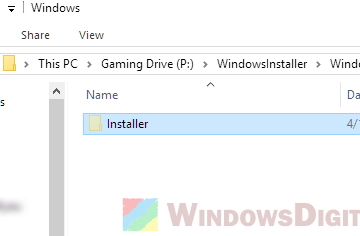 Description for sharing: Looking for alternative photo viewer to replace Photos app in Windows 10? 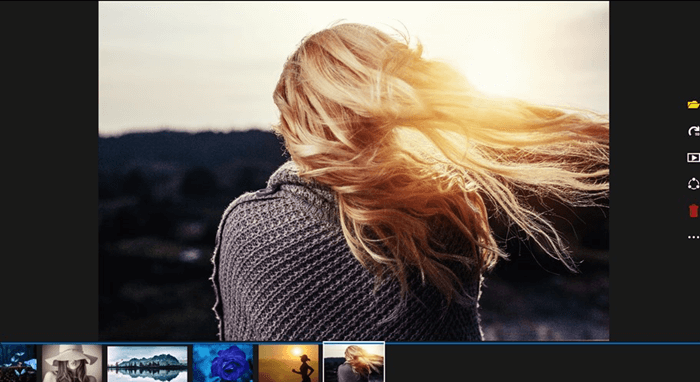 Here's a list of 3 best photo viewers for Windows 10 free download.